Six former guards at Montgomery County Correctional Facility in Eagleville, PA have been arrested for assaulting two inmates. They have been charged with aggravated and simple assault, conspiracy and other offenses. It happened on February 14th. Surveillance video shows that inmates Derrick Houlihan and Matthew Ruffings were beaten while in their cell. Houlihan, who wears a prosthetic leg, was taken to the medical facility and beaten again. Several of the officers were wearing body cameras, but they either did not turn them on or destroyed the video. 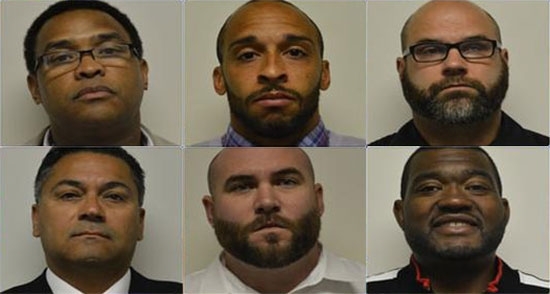 The former officers charged are: Edwin Negron (captain), Darin Collins (lieutenant), Alfred Gregory, Jr., Anthony Saxby, Randall Sims and Jason Marshall. They were arraigned this morning and released on $50,000 bail. A seventh guard was fired in the incident, but was not charged. Philadelphia Police shot and killed a suspect early Friday morning in Southwest Philadelphia following a domestic incident. It started at 1:30 a.m. when officer's went to a home on the 1200 block of South 51st Street to serve a protection from abuse order. The man left the house but returned around 2:45 a.m. Officers were called back to the scene because the man violated the order. The suspect pulled a 10-inch knife and lunged at police. One officer used a Taser on the man, but he recovered quickly. The man came at the officer again with the knife. That's when the other officer fired his weapon. The suspect was taken to the hospital where he was pronounced dead at 3:30 a.m. The officer, a 3-year veteran, has been placed on administrative duty while the officer involved shooting is investigated per standard procedure. Hundreds of college rowing teams are in town this weekend for the Dad Vail Regatta. Before races even began, one team from Pennsylvania is facing a huge setback. On Thursday, the crew team from the University of Pittsburgh arrived and parked their vans near the Girard Avenue Bridge and Kelly Drive. The team was gone for about two hours, but all that was left when they returned was broken glass and empty vans. All of the team's equipment and uniforms as well as rower's backpacks with personal items, clothes, and electronics were stolen. They say that they won't let this keep them from focusing on the race, they'll direct their anger and frustration out on the water.